Our lock prevents anyone from picking the lock or using a stolen master key when you are home. Criminals can learn to pick your lock using techniques like lock bumping online in 5 minutes and for under $20.00 they will mail them a set of bump keys that work on most of the deadbolts on the market. It can also prevent those embarrassing moments when you step out of the shower only to find maintenance staff in your unit. The lock was designed so that it can never accidentally lock you out of your home and if you have small children who love to play with locks, simply keep the pin on your key chain at the front door. 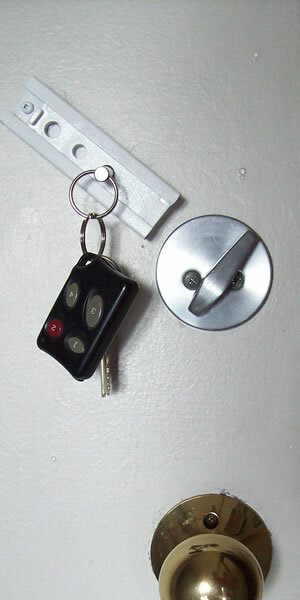 If you need to step out (like to the garbage chute) just take your keys and pin with you to avoid being locked out. An added benefit of using our lock on the door is if you were injured and could not get to the door and the building staff know that you have our lock on the door. They can simply drill out the tumbler on the deadbolt and the thumb turn will fall off disengaging our lock and allowing them access to your apartment. This will cost you under $30.00 in damages where if you have a security lock that attaches to the door frame like the Door Guardian, they will have to break the door down which may take longer and cost thousands in damages to the door and the frame.